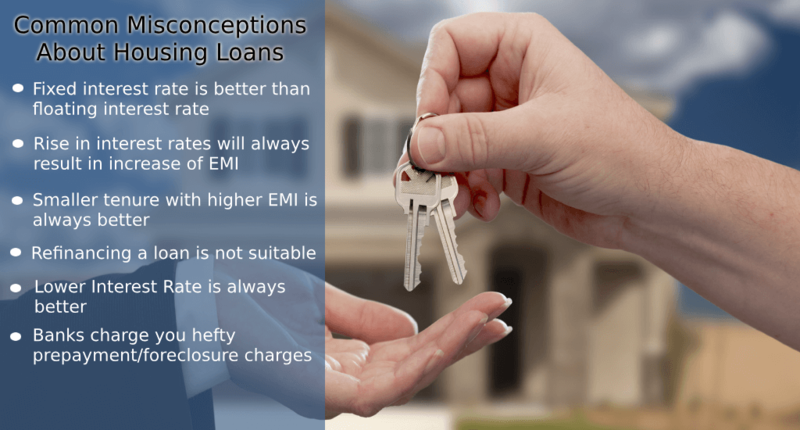 6 Common Misconceptions About Housing Loans - Know The Truth! Buying a home is a lifelong dream for many of us and since making a down-payment of lakhs of rupees to buy our dream-home is not practically viable for everybody, we almost always end up going for a 'Home Loan' or 'Housing Loan'. Most probably, 2 out of 3 people reading this article would have either taken a home loan or at least would be thinking about going for a home loan. As with many things in our country, there are some misconceptions about housing loans which effectively scare us from moving forward. The purpose of this article is to help you understand the truth about those common misconceptions. Home Loans usually come in two forms - one with a fixed rate of interest and the other with a floating rate of interest. If you are someone who doesn't want to risk the fluctuation that is possible on home loan rates, you can choose the fixed rate option. However, there is a catch here - Even if in future loan rates go down, you will still continue to pay the high rate. If you had chosen the floating rate option, reduction in home loan rates would benefit you greatly. But, this floating rate option has its drawback too. In case market rates go up, so will yours. So, you need to think and decide based on the market outlook. Anyway, these days banks don't offer 'Fully Fixed' home loans like they used to, before. Most fixed rate home loans these days are hybrid loans where the rate of interest is fixed only for the first few years and the bank reserves the right to review the rate of interest after this initial period. Fixed Rate loans usually charge the customer a slightly higher rate of interest than floating loans because the bank cannot hike your interest even if the market rates go up. I think going for a flexible rate of interest is OK given the current market outlook because the rates of interests have gone down in general. Even if reverse trend occurs, same will not go up by more than 0.5% to 1% and it does not make sense to pay the additional interest right away. Yes, in case of a Floating rate home loan, the rate of interest is subject to change, if the market lending rates change. However, the biggest concern point for most loan customers is: what if my EMI goes up? A home loan is a big financial commitment and if the monthly EMI goes up by even a few thousand rupees each month, it could significantly affect our day-to-day life. However, most banks will not increase your EMI without intimating you and getting your concurrence. When the market rate changes, the bank will give you a choice, whether you want to extend your loan tenure or increase your EMI. You can choose either option based on your preference. So, don't worry. The tenure extension might not be available if you are very close to your retirement age. Most loans are offered with a tenure that leaves at least 5 more years until your actual retirement age. So, if your loan is ending by the time you will be 58 and this recent rate of interest change would result in increasing your loan tenure by 4 years, the bank will refuse because you will most likely retire when you hit 60. So, they won’t give you this choice. You will be forced to take the higher EMI. However, as long as you have a few years between the loan end year and your retirement, you can always choose the extended tenure option. During the tenure change, the bank will restructure your loan repayment in such a way that your new EMI amount stays as close as possible to your current EMI amount. However, it is not always feasible to have a tenure extension with absolutely no change to your EMI. If your current EMI is let’s say Rs. 24,500 per month and after the tenure extension it could become 24,572 or 24,445 or something that is very close to your earlier EMI. The Bank will clearly communicate the change and also give you the choice of proceeding ahead. The best choice would be to pay cash and buy a house without a loan. However, not many people can afford this luxury due to which we go for the loan. And, while going for this loan, the EMI depends on your loan tenure. You need not be a rocket scientist to figure out the fact that the 10-year loan is the best choice as against the 30 years one because you are repaying 81 lakhs for the 10-year loan while you are repaying 1.6 crores for the 30-year loan. However, do you think everyone who takes a 50 lakh loan can afford to repay 67,467 every month? For the ones that can afford it, yes the 10-year tenure would be the best choice. But, if let’s say you cannot afford this, you choose the EMI/tenure combination that would be the most comfortable for you. Yes, we all want to finish off our loan fast and pay the least amount of interest to the bank. But, do we want to do that, at the expense of financial struggles that we would face each month? Would you want to compromise on your families living just to finish the loan a few years soon? This is why I say, a smaller tenure is not always better. Select an EMI/tenure combination that you can comfortably repay. Thereafter, when you get a good pay raise, talk to your bank and rework the EMI so that you can finish off the loan quicker. Ok, this is probably the biggest and most unbelievable misconception people have. You are free to refinance your Loan, any time you want if another bank is offering you a great rate of interest. Let me give you a real-life example. My dad bought a small 1 bedroom apartment in 1997 and borrowed 1.25 lakhs as home loan for which he was repaying about 2400 rupees per month as EMI for a 20-year tenure. In the year 2003, a family friend suggested that we refinance the home loan with Indian Bank that was offering the loan at just 11% per annum. After refinancing our EMI was 1450 per month and the tenure was changed to 15 years. Guess what, the amount my dad refinanced was 1.2 lakhs because the old bank claimed that we had only repaid 10,000 rupees in principal and went ahead and charged us a fee for early closure. In spite of this, we went ahead with this because, over the period of the next 15 years, we would end up paying almost 2 lakhs lesser to Indian Bank and refinancing made perfect sense. You are not obliged to finish your loan with the same bank you started. So, if you feel that some other bank is offering you a better home-loan deal, go ahead. It is your money and you have absolutely every right to save as much as you can. Ok, before you declare me crazy read out the next couple of sentences before you decide. A Bank that offers the home loan at the lowest rate of interest might not necessarily Offer you the full loan amount you want or Have real crappy service or Charge you exorbitant up-front fees or Force you to sign-up for some random ULIP scheme just to get the home loan or I could go on and on. If I were given a choice between a bank that is offering me good service, the loan for the full amount I asked for plus very low fees at 10.5% and a bank that is offering me only 90% of the amount I asked and offers lower quality service at 10% interest, I will definitely go with the earlier because I don't have to worry about service quality and nor do I have to worry about arranging for an additional 10% of the money that they aren't giving me. Of Course, if I can get the same loan amount and same quality of service at a lower interest rate, I will obviously choose those guys. The point here is, lower rate always doesn't mean better. Ok, this was true up until a couple of years ago. Effective June 2012, banks cannot charge any loan prepayment charges in India anymore. In fact, banks aren't even supposed to charge you for refinancing your loan (see misconception no. 4). So, if you got sudden cash influx (A bonus or an inheritance) just go ahead and close your home loan. I really hope this article helped clear out many of the misconceptions you may have had about home loans. To explore best home loan schemes from different lenders, log on to Afinoz or mail us at info@afinoz.com. We are here to serve you the best financial products without any hassles.